Contact either the Concord Campus Library (925) 602-6725 or the Hayward Campus Library (510) 885-3612 for information. It is the CSU East Bay Library’s policy that all filming, videotaping and photography in the Hayward or Concord campus libraries for any purpose must be approved in advance by the University Librarian or his/her designee. Permission to film is granted on a case-by-case basis and may depend on a variety of factors, some of which are noted below. The use of the Library for commercial filming (i.e. videography or photography that may be used in advertising or in commercial television, website, or cinema production) must be approved by the University Librarian and the University. 1. No production which advertises or promote products, services or programs that are inconsistent with the values and traditions of CSU East Bay and its Library shall be granted access. This includes visual images, dialog, voice-overs or text. 2. No student, patron or employee of the University shall be used in any productions unless an Agreement Release Form is obtained from that individual before their image is taken. 3. No production shall interfere with the normal operations of the University and its Library. The requestor must agree to conduct the filming or videotaping during a time least likely to disrupt patrons. All reasonable safety measures, including taping down of wires and extension cords, must be taken. 4. Any filming or other production can be suspended without notice in the event of an emergency (i.e. fire, earthquake) at or near the production location. Any University property that has been moved during production must be replaced in its original position. If you must move any furniture, please do it at a minimum. Please use masking tape to denote the original position, so that furniture may be relocated. Any books removed from the shelves, should be placed on a reshelving table. Again, the removal of books from shelves must be kept to a minimum. 5. Any damage to University property caused by the activities of the production shall be the sole responsibility of the persons involved in the production and they shall be presented with an invoice from the University. 6. The production will not use the University’s name, nicknames, logos or symbols be used without prior written consent. 7. The requestor agrees to abide by all University, Library, State of California and Federal policies, procedures and laws. 8. The University is released from all liability, claims, suits, actions, damages, settlements and expenses arising out of injuries, damages to property, claims based on infringement of rights to copyright, trademark, service mark or other intellectual property and all other damages in connection with Requestor’s activity. Please feel free to notify a library employee if your study is being disrupted by someone else in the library. See our Standards of Behavior Policy for more details. To report a disturbance, please inform any library employee, or call 510-885-3612. Group Study Rooms can be reserved using the D!BS reservation page. You are required to enter your first and last name, as well as your Horizon email address. Entering false information may result in the cancellation of your room reservation. 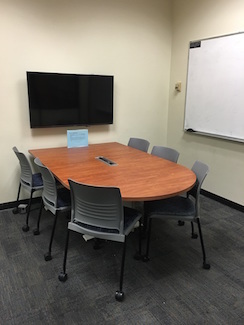 Study Rooms can be reserved for one hour per student per day and may only be used by groups of 2 students or more. Report any issues with the Study Rooms to the Media Resources and Reserves Desk (Library Upper Mall). 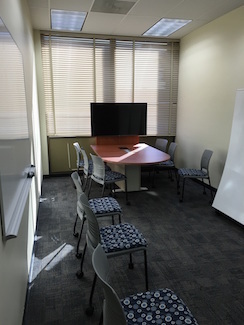 You may book the Library Presentation Room at the Media Resources and Reserves Desk. The libraries are not responsible for items left behind by patrons. Items left in the libraries may be turned into the lost and found locations at any of the public services desks; Main Circulation Desk, The Learning Commons, Media Resources and Reserves, SCAA and the Concord Campus Library Main Circulation Desk. Items determined to be of value (i.e. wallets, cell phones, computers, passports, etc.) are taken to the University Police Department daily. Please contact the University Police in person or call (510) 885-3791. Once a week, all remaining articles will be taken from the libraries' lost and found locations and disposed of. Patrons may inquire about their lost items by coming to any of the public services desks; Main Circulation Desk, The Learning Commons, Media Resources and Reserves, SCAA or the Concord Campus Library Main Circulation Desk and providing an adequate description of their lost items. Valuable items are taken to the University Police Department. All remaining articles will be disposed of every Thursday. Lost University ID cards are held at the Main Circulation Desk for three months. Hazardous or perishable items are IMMEDIATELY DISCARDED.